The majority of Californians support bringing more renewable energy online. However, connecting a solar project in California is often an arduous and expensive process that can take years — adding uncertainty and added costs to project development. This is particularly true for wholesale distributed generation (wholesale DG) projects. 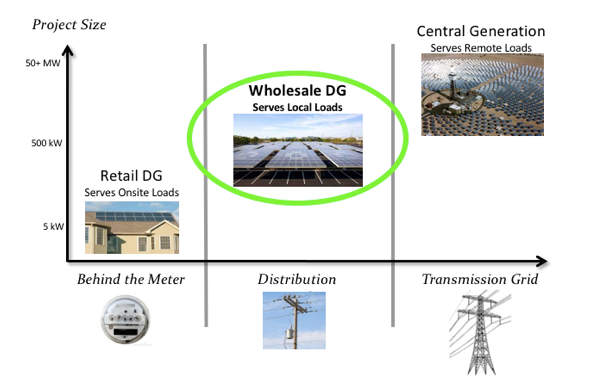 As shown below, wholesale DG systems connect directly to the distribution grid and sell all the power produced to the local utility, which is used to serve local electricity demand. Unfortunately, wholesale DG projects face a lengthier, riskier, and more costly utility interconnection process compared to similar sized net energy metered projects. Net energy metering (NEM) is an indisputably effective policy for deploying retail distributed generation projects across the country. It typically works best for residential installations, like rooftop solar on a single-family home, and on other owner-occupied properties. NEM projects utilize streamlined interconnection processes to connect to the grid, which is vital for the policy’s success. 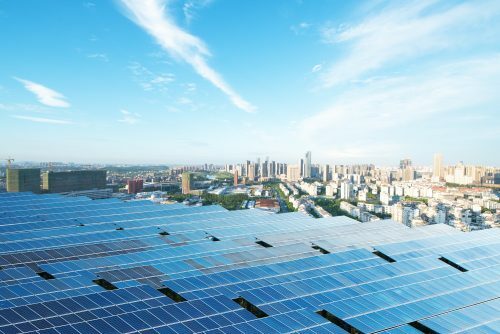 It is worth mentioning that NEM does not effectively address the commercial-scale solar segment, including non-owner occupied properties, split-metered facilities, and sites with little on-site load. Wholesale DG projects can be a great fit for these types of locations; however, an improved process is needed to connect wholesale DG projects to the grid. In Pacific Gas & Electric’s (PG&E) service territories, wholesale DG projects of up to 5 megawatts (MW) can seek interconnection through the utility’s “Fast Track” process, but most projects do not move quickly through this process. A whopping 82% of Fast Track proposed projects get stuck and never receive interconnection approval from PG&E. Since 2012, PG&E’s Fast Track program has received 209 interconnection applications for solar projects of 5 MW or less. Of these 209 proposed projects, 37 of them made it to the interconnection agreement stage, while 172 dropped out of Fast Track altogether. With a project success rate less than 18%, improvements can surely be made to the Fast Track program in order to streamline interconnection for wholesale DG projects. The Clean Coalition, which is leading the Peninsula Advanced Energy Community (PAEC) initiative, studied this high failure rate and developed recommendations to streamline the interconnection process for wholesale DG projects. The result is a new report, titled Best Practices: Interconnection for Local, Commercial-Scale, Renewable Energy Projects, which investigates best practices for wholesale DG interconnection policies and provides clear recommendations to streamline the process in California, with a particular focus on projects sized up to 1 MW. Our research uncovered that it typically takes a year and a half for PG&E to approve a 1 MW wholesale solar project through its Fast Track program. By analyzing PG&E’s quarterly filing with the California Public Utilities Commission, the Clean Coalition was able to determine exactly where delays occurred. A typical 1 MW project going through the Fast Track approval process can endure up to 575 days of waiting in various stages, including: site control, numerous project reviews, drawing up contracts, and grid upgrade construction. The Best Practices: Interconnection for Local, Commercial-Scale, Renewable Energy Projectsreport offers specific recommendations to improve the predictability, flexibility, and objectivity of the wholesale DG interconnection review process with the goal of improving the project success rate. The Clean Coalition’s recommendations include: transparent application and review processes, predictable and reasonable timelines, enhanced queue management, dispute resolution procedures, and clear cost-certainty measures. Simultaneously, these recommendations align with the goals of Assembly Bill 327, which required utilities to develop grid planning strategies and programs for the deployment of distributed energy resources, including local renewables at locations on the grid that can accommodate new local generation without expensive interconnection costs. Compared to the expeditious process for NEM projects, the interconnection process for wholesale DG projects is woefully inadequate. By adopting the recommendations from this PAEC report, utilities can improve the predictability, cost certainly, and timeline for interconnecting wholesale DG projects to California’s grid. As a result, California will be able to bring more affordable clean local energy online — reducing greenhouse gas emissions, improving the resilience of the grid, and avoiding the need to build new, costly transmission infrastructure. The Peninsula Advanced Energy Community (PAEC) is a groundbreaking initiative to streamline policies and showcase projects that facilitate local renewables and other advanced energy solutions like energy efficiency, energy storage, and electric vehicle charging infrastructure. 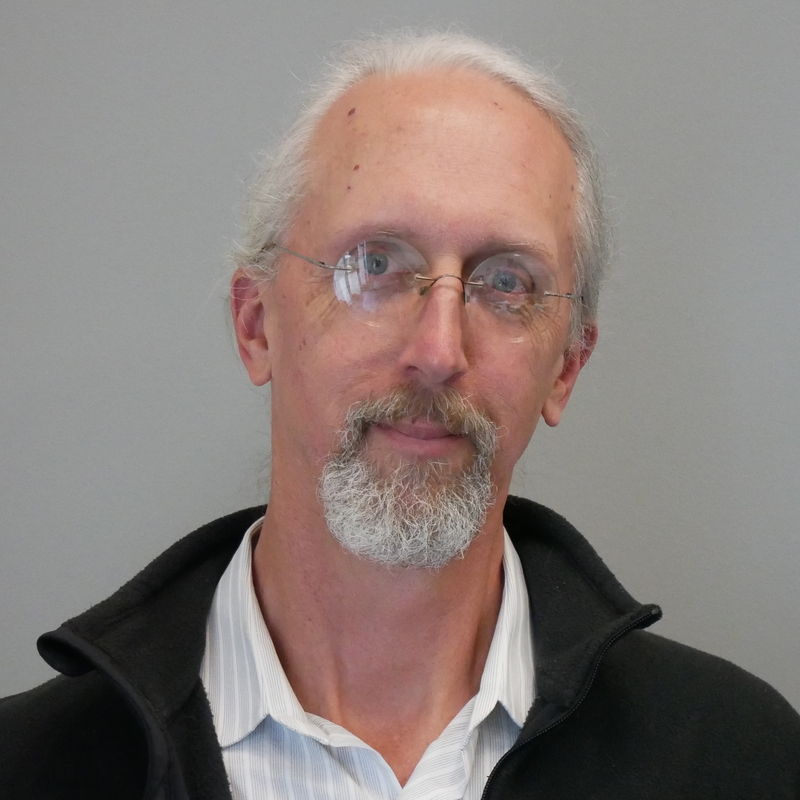 The PAEC will create pathways to cost-effective clean local energy and community resilience throughout San Mateo County and the City of Palo Alto; and beyond. The PAEC is a collaboration between the Clean Coalition, the California Energy Commission, Pacific Gas and Electric, and an array of municipalities, emergency response jurisdictions, schools and universities, and corporate entities. For more information, please visit www.clean-coalition.org/PAEC.